This is the pattern for the heart I showed a few posts ago. I you have any questions please let me know. *Special note when you do this step make sure to maintain your direction of work. It’s really easy for the rose to flip sides until you make the lj at ring 6. # instead of doing the lj and SLT separately you can accomplish the same task by pulling up the ball thread and pass the shuttle through the loop as in a normal join. Pull up the ball thread until it pops out the other side. This locks in the stitch and switches the threads at the same time. Don’t do a 2nd ½ just go into the next stitch. This one is really pretty! I want to try it! I've ordered some of Yarnplayer's new HDT so maybe I'll try it with that when it arrives! I added a link to this pattern on my "Tatting Patterns I'm Gonna Tat" page. Very pretty! I'm working on a wedding hanky for my nephew's fiance, and I think this would look beautiful on it! Wonderful! Actually I tatted something from what you had before but it was mostly to see how the ruffled arch would go...I had one side bigger than the other because I didn't count sets and I think I didn't bother to post it. I'll have to try this more precise pattern! That's a small little pretty thing! So tattable. I'm going to make it soon. Pretty! Thanks for posting it. Ooh, what a graceful, feminine shape. I've GOT to try this heart! Thanks for posting the pattern. Now, young lady, what I REALLY, REALLY want to know is where you've been hiding with all this design talent for so long? Brilliant design. Can't wait to meet you in September. This is lovely. Thanks so much for sharing! Thanks for sharing the pattern. It is really pretty. Thanks for all your enthusiasm! Please let me know about any problems with the pattern. I would love to see pictures! Hi Vicki! I just wanted to let you know that I tatted this heart pattern and I really enjoyed it. I thought the pattern was well written and easy to follow. You are welcome to come visit my blog post on it! 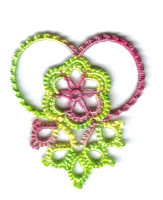 This little heart is so pretty and the colours you chose are lovely....I just saw a post on it now so have downloaded the pattern and am ready to go. Hi there! 'Tis me again! I just wanted to let you know that I just posted aboutyour heart on my blog again!